Rodney McAree. Pic by PressEye Ltd.
Irish Cup glory remains a goal for both Glenavon and Dungannon Swifts but league points provide the prize this weekend at Mourneview Park as the focus turns to a top-six push. Quarter-final delight last Saturday left the Lurgan Blues and the Swifts having secured Irish Cup last-four spots. Both squads will use the chance to step out on the semi-final stage next month as motivation across the league games - with Glenavon sitting sixth and holding a six-point advantage over the Swifts in the current standings. “We have a good group of players who work hard together and team spirit is key to any progress,” said Swifts boss Rodney McAree. “That’s what we must take into the Glenavon match as the top six is still in sight, even if we only have an outside chance. Glenavon boss Gary Hamilton is relishing the run-in over multiple fronts. “There is so much to play for and the games coming up provide extra motivation every week,” he said. 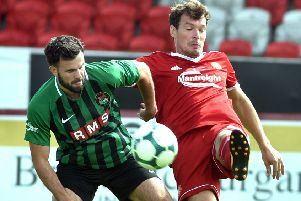 “Everyone wants to be involved in the big games in the Irish Cup or to get us inside the top six and pushing for European football. “The team will change with suspensions, injuries or if we opt to rest players due to the playing conditions. “But it always comes down to producing and holding on to the jersey.